The U.S.-China competition over technology has reached a peak in recent months. In August this year, the Trump administration signed a bill banning government use of Huawei and ZTE technology as part of the broader Defense Authorization Act. This was the latest salvo by Washington after a 2012 House of Representatives report that labelled both Chinese firms as national security threats, with the heads of U.S. national security agencies recommending against using either companies’ products. Close U.S. allies, including Australia and New Zealand, have made public their policy of banning Huawei from the future 5G telecoms network – the next-gen critical national infrastructure expected to revolutionize technology application into economies and day-to-day lives, making driverless cars, smart cities and other large-scale applications of connected devices feasible commercially. While the United Kingdom has not outright banned Huawei, it has demanded the Chinese company address security risks in its equipment and software – after British telecoms giant BT Group announced that Huawei will not supply equipment for its core 5G network and it will be removing Huawei equipment from its core 4G infrastructure. These global developments suggest that technology, specifically the impending rollout of the 5G network, will become the next front – or proxy – of U.S.-China competition. Three observations support the hypothesis that 5G could radically redefine the most important bilateral relationship in the world. First, 5G technology will support next-gen digital applications that permit ultra-fast, low latency (or lag), and high-throughput communications. These new apps are likely to fuel the future smart cities and digital economies, predicted to be the next key driver of economic growth in the much-touted Fourth Industrial Revolution. As a result, the superpower that gains a first-mover advantage in resolving the many technological, political, and policy challenges and successfully deploys the 5G network is likely to gain a significant economic edge over the other. This makes 5G implementation a zero-sum economic game – as viewed from an Chinese or American lens – rather than a win-win situation where technological advancements and solutions are shared for mutual gain. 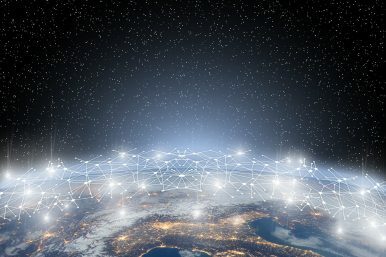 From the geoeconomic perspective, 5G networks could become such a game-changer that the technology tilts the balance between the world’s first and second most advanced economy. The geoeconomics also applies to other states at the periphery of the two superpowers. Whichever superpower that successfully deploys 5G can claim to replicate its model in other countries and exert geopolitical, economic, and technological influence over these states. Therefore, 5G has the potential to be the next leverage tool that the United States and China can wield in the great power competition to redraw the lines between the U.S. and Chinese camps – especially in Northeast, Southeast, and South Asia. Second, the prevailing global sentiment of possible Chinese cyberespionage through the technology it exports has its roots in the United States, with its national security agencies labeling Huawei and ZTE – heavyweights in the tech industry and front-runners of 5G technology – as potential national security threats. Despite the perceived security assessment that the use of Chinese equipment and software could damage U.S. security interests (which is certainly possible), there remains no concrete evidence to date supporting the cyber threat that Washington has hypothesized. Fundamentally, there is deep distrust on the part of the American national security establishment toward Beijing more than any concrete Chinese practices. This has precipitated the concern that the United States is susceptible to Chinese cyberespionage, or even subject to the disruption of critical cyber-infrastructure that may paralyze the nation. This suspicion is manifested in the decisions of the U.S. government regarding the use of Chinese equipment in 5G, and more broadly, the use of Chinese equipment by the government. The 5G issue is thus a conduit through which U.S. fears of Chinese hegemony is materializing, and the outcome of 5G could become an important proxy to assess the state of the U.S.-China bilateral relationship – or the depth of how icy it could get. Third, the concern over their cybersecurity has driven states to coalesce around American leadership – and policy – on the future 5G network. Indeed, the countries that have publicly adopted the U.S. position are either its allies or close partners. It is notable that the other three members of the Quadrilateral (or Quad) grouping of countries – Australia, Japan, and India – appear to be joining the U.S. camp, along with some of its European allies. It is a matter of time before the United States and China separately gather allies to take a position on the issue of incorporating Huawei or ZTE’s technology in 5G networks. This is already happening. It would create de facto “spheres of influence” in Asia and beyond – reminiscent of the “spheres of influence” created during the Cold War by the United States and the Soviet Union. States that have heretofore been sitting on the fence and unwilling to commit to either Chinese or American policy on the matter could be forced to take a stand under intense diplomatic pressure. This would specifically apply to states like South Korea, the Philippines, Thailand, and Vietnam – countries that are ostensibly strong U.S. military allies or close partners, but which also fall within Beijing’s political influences due to their proximity to the middle kingdom. 5G as Proxy: What’s the End Game? Through the 5G issue, it is likely that both superpowers will take stock of and develop a clearer picture of where each country – Asian or otherwise – stands on the broader U.S.-China geopolitical chessboard. This will have repercussions beyond 5G, into the more strategic positioning of the two superpowers on the international stage. There is no clear end-game for the 5G issue, as both Beijing and Washington posture for the “hearts and minds” – or telecoms networks – of states. What is obvious is that the 5G issue is no mere technical or security problem, but one that has vast implications for the U.S.-China modus vivendi from the economic and political perspectives. After all, the stage is set for 5G to become a proxy battlefield for global technological, economic and (eventually) military supremacy – and one that peripheral countries must carefully manage to avoid becoming collateral damage in the great power rivalry that is heating up. Jansen Tham is a Masters in Public Policy graduate of the Lee Kuan Yew School of Public Policy, National University of Singapore, specializing in Politics and International Affairs.